Electrical currents have long been a part of the SkinSense anti-aging arsenal. They provide many benefits for all skin types. So let’s discuss the various protocols that we use continuously during our facials with great results. Ultrasound consists of high frequency sound waves that are particularly good at getting rid of waste both on and in the skin. For example, we all love mineral cosmetics but the powders in particular tend to stick in the pores. Some sunscreens do the same thing. Ultrasound ensures that the pores are cleansed thoroughly and that the skin surface is scrupulously clean during treatment which enables later absorption of the anti-oxidants we apply. Ultrasound also increases blood circulation, stimulates the lymph flow and reduces puffiness. Indulged in too much salt or not getting enough sleep? 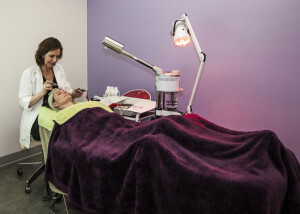 That tired, puffy look will vanish after an ultrasound facial. The heat produced on the skin by the ultrasound current is mild and can be very healing for skin that has been burnt or for acne lesions that have left scarring. Not to mention the anti-aging benefits of collagen production. The notable feature about the ultrasound unit we use is that the bracelet worn during treatment to conduct the current is a form of Galvanism. The Galvanic current operates by electro-osmosis using negative and positive ions as a method of transport. It helps active ingredients, such as moisturizers and cleansers, do their work. This current is ideal to treat dry and sensitive skin. This is an electric current with a topical frequency of 10,000 or more cycles per second; it produces no muscular contractions and does not affect the sensory nerves but is very useful to ensure the skin is completely clean after extraction by killing bacteria and promoting healing. This blend of electrotherapy ensures great results for a myriad of skin conditions and all three are very relaxing to experience.